SKU: VFM-058W. Categories: TVLogic, Viewfinder. Tags: TVLogic, 450 cd/m2, 5.5", HD-SDI, Integrated Speakers, LED Backlight, VFM. 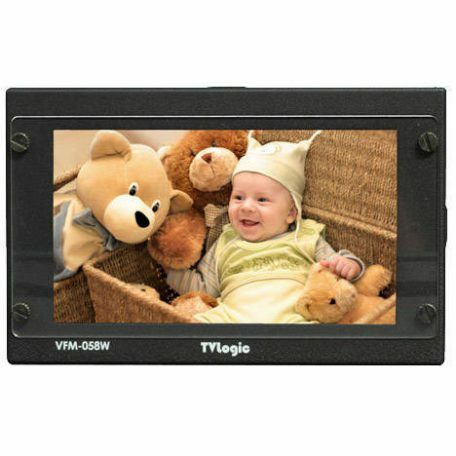 The TVLogic VFM-058W is a lightweight viewfinder monitor which produces outstanding image quality on its 5.5” Full HD resolution LCD screen. The innovative and ergonomic design of the VFM-058W makes it comfortable to handle in shooting environments and the light yet solid magnesium case allows for the highest efficiency of cooling and ventilation. The VFM-058W supports multi-formats including 3G/HD/SD-SDI and HDMI providing it with a wide application range from DSLR cameras to Pro camcorder for broadcast and movie shooting. The VFM-058W has various features such as Max. 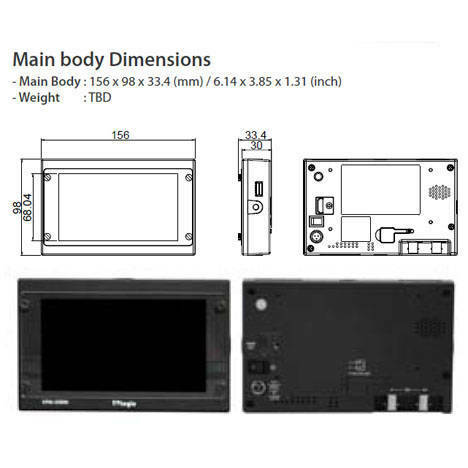 Brightness function, Temperature Adaptive Colour, HDMI-to-SDI conversion output, 1:1 pixel mode, Luma(Y’) Zone Check function, DSLR Scale, Waveform, Vectorscope, Range Error, Focus Assist, Markers, Audio Level Meter with speaker and time code display. It is an all round performer designed to give camera operators and other on-set technicians the very best small monitor solution.